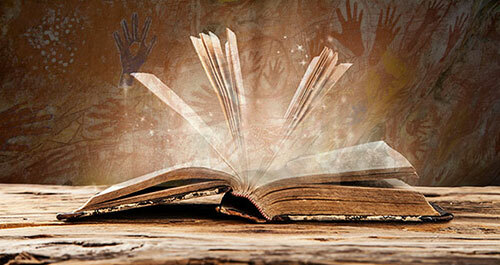 We have over 1000 Aboriginal artworks, artefacts & gifts + 100’s of photos, stories & videos to explore & view! Aboriginal Art has been described as the last great Art movement to be discovered! Whilst being one of the oldest forms of art in the world, it is by commercial standards, very young. 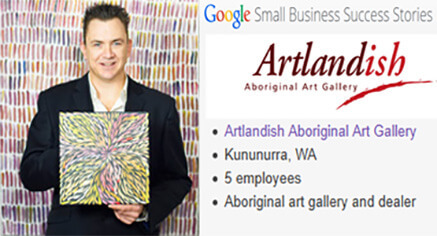 Artlandish has been in business 16 years & specialise in providing customers with the Highest Quality Authentic Aboriginal Artworks at the best possible prices. If we have one bit of advice re buying art it would be to always buy what you love! That way, you can never go wrong. Enjoy! All paintings purchased online come with a Money Back Guarantee, a certificate of authenticity of the Highest Standard as well as exceptional provenance so you can acquire with complete confidence. Provenance includes the Artists’ name, a detailed profile, story/description of the artwork, a photograph of the artist, and where possible and permitted, a photograph of the artist with the completed work. Whilst not always possible, we will also provide working images of the artist executing the piece whenever they are available. Artlandish Gallery has invested millions of dollars back into local Aboriginal communities over 16 years. Purchasing artworks through Artlandish contributes to a direct injection of monies into local Aboriginal communities. It provides many Artists & their families with an opportunity to earn immediate income with no delays on payments as Artlandish always pay the Artists we deal with directly immediately upon completion of an artwork! Artlandish is Located in Kununurra, in the heart of the very beautiful and World renowned Kimberley region of Far North East Western Australia. This web portal contains our Online Gallery with 1000+ paintings, artefacts and gifts to view & purchase. You may also like to visit our Information Centre & Library with an abundance of information, photos and video covering a wide variety of Aboriginal traditions and culture segments. Cheers! Check out these must see gallery highlights below! Click the image to visit our online library with Aboriginal Art articles, stories, insights, facts and much more! 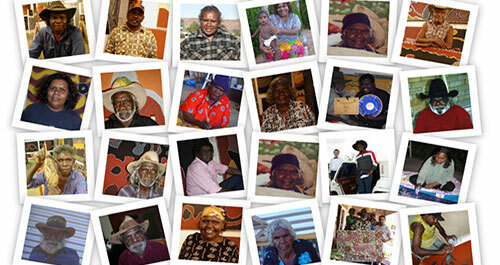 Click the image to view more than 80 biographies and stories from the leading Australian Aboriginal Artists! 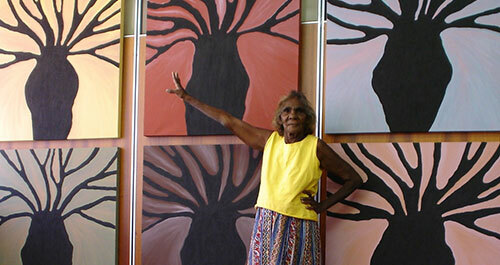 Lily is one of Australia’s most important contemporary aboriginal artists. Whilst she varies her subject matter, she has never compromised on style. Lily’s paintings are instantly recognisable. Lily paints Wandjina – with varied totems, rain dotting, lightning (Black Wandjina), turtles, cave pools with bubbles; all different but all Lily Karadada. Vale 2017 – Churchill was the Senior artist of a renowned family of ochre artists. His mother-in-law Betty Carrington and her husband Patrick Mung Mung, full sister Nancy Nodea, his former wife, International artist Sade Carrington and in particular their already famous daughter Charlene Carrington. Ju Ju is a member of a well known painting family – her grandmother Sheba, her mother Freda (dcsd.) and her daughter Reagan – four generations of very talented ladies. Her paintings and artefacts are collected world-wide. In 2002 Ju Ju was asked to paint trophies for the Dubai Racing Club, home of the World’s Richest Race Meeting. These trophies featured Australian Indigenous Animals and were stunning. He is undoubtedly one of the most naturally talented Australian artists. Mark’s design won the 2002 Royal Australian Mint International Award for Pure Silver Collector Coin. The Royal Australian Mint has only released ten such coins since 1983. He has participated in Group Exhibitions and his first Solo in September 2003 at the prestigious Alison Kelly Gallery in Melbourne was a sell out success. Shirley has participated in many exhibitions since 1994 in every capital city in Australia, as well as in London and Germany. Her artworks are valued and included in high profile collections such as the Kerry Stokes Collection and Universities throughout the Country. George paints the Tingari stories for this region. Tingari Cycle refers to ancient stories of the ancestral Tingari People who travelled the land during mythological times. One of Georges most significant achievements is winning the prestigious 2004 Wynne Landscape Prize at the Gallery of New South Wales for his topographical depiction of the Western Desert country. The content of Gabriella’s paintings is the Dreaming stories handed down to her from her paternal grandmother, Long Rose Nungala and the other senior women who taught her in her formative years. These include Grandmother’s Dreaming, Seven Sisters Dreaming (Milky Way), Goanna, Bush Tucker and Serpent Dreamings of her Anmatyerre heritage. Barbara’s dreamings include Bush Berry, My Mothers Country, Awelye and her famous Grass Seed dreaming. Barbara’s artworks have been exhibited extensively throughout Australia and the world, including Japan, America and Europe. Stylistically, Sarrita utilises traditional Aboriginal techniques such as ‘dotting’ but also incorporates unorthodox techniques inherited from her late father, as well as self-developed practices. Her art is a fusion of the past, present and future and represents the next generation of artists who have been influenced by both their indigenous history, and current Western upbringing.